The word Control is from the English translation of Cybernetics. Because the control indicates the politics in which the subject is the relational status between control and being controlled implying in aaajiao’s work. The meaning of control applies to the interaction between control and interactive fact clearly. Only this kind of the interaction applies to the living form (especially refers to the reaction organism system of the intelligent, such as the five senses of human, etc). 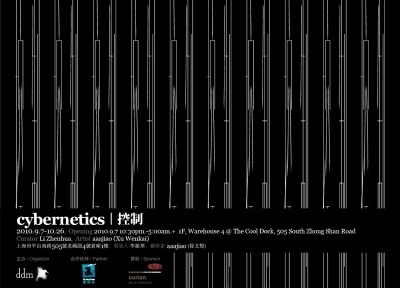 But cybernetics meaning to aaajiao’s works, has develop a certain process in time. The interaction can be understood in the cybernetics circle. The word cybernetics doesn’t share the same meaning with the word control. Many people have confusion about interaction, someone understands it’s the human beings control the machine, or by control the computing system, then to effect the machine or computer’s interacts under the particular instruction. Indeed, it is another feature formed after the emergence of the computer, in order to meet the requirement of utility. But there are also a feature from the fear of computer and machine losing the control. This perspective is widely spread through the science fictions, movies and other ways to improve the human imagination on its negative side. Such as 2001: A Space Odyssey, the scene of the astronaut killed by the computer strengthens our recognition of the coldness of machine and computer. The movie often ends up with the fear of the control and the loss of the control. Obviously, what the cybernetics needs here is not a complete control, but the adjustment during the processes, in order to reach the interactive process of the reaction. Then the dynamic requirement and diversities of the control itself can be involved. The cybernetics in aaajiao’s series works of measurement, transfers the invisible knowledge and data into the visible process of cognition in daily life. This kind of work can be understand as conceptual art as well, not only being understandable in the territory of cybernetics. The visual object’s status is still from the context of contemporary art. From the concept to the visualization onsite projects by Aaaajiao’s effort, one can see what is coming.